Professional voice actors pride themselves on range. So, hiring a few good VAs means you can take care of many, many characters with a small cast (especially if one or two actors are a Man of a Thousand Voices). Not to be confused with Adventure Narrator Syndrome, Sounding It Out, Thinking Out Loud or Talking to Themself. Compare Holding Both Sides of the Conversation, which is an in-universe example of this trope, where a character is pretending to hold a conversation with another non-present (or non-existent) character, in order to maintain some kind of charade. Compare also Solo Duet, which is when one singer performs both sides of a duet. Same with Kozo Shioya in the Japanese version, who voices all of Boo's forms—so in addition to the above, there's also Fat Boo and Skinny Evil Boo's brief fight. Mashiro Kazahana and Fumi Himeno share a voice actress in the original Japanese version of My-HiME, which partially underlines the otherworldliness of both characters. Yukino Satsuki as well as her dub counterpart Megan Hollingshed, as Mion and Shion Sonozaki in Higurashi no Naku Koro ni. Justified—they are identical twins. Barely averted where the same English-dub voice actress does Tsukasa and Minami. (In the original Japanese, they have different seiyuu.) Minami's in Yutaka's group though, and she's also The Quiet One. Many background characters share the same seiyuu or dub voice actor, but they don't interact. In the 4Kids dub, there were a few examples of this, and all of them were main characters. Veronica Taylor—Ash, May, and Delia Ketchum ("The Right Place At The Right Mime" had May and Delia sounding very similar). Rachel Lillis—Misty and Jesse. Eric Stuart—Brock and James. Oh yeah, Ted Lewis did James for the first several episodes, didn't he? Well, he went on to do Giovanni and Tracey, though that's not an example. The American dub of Seven of Seven only avoids this if you consider the various Nanas to be one character; if not, you have Veronica Taylor doing all seven Nanas (and two of them use her "Ash" and "May" voices!). The original Japanese version used different actresses for the different Nanas. In both Tenchi Muyo! and the Pretty Sammy OAVs, Sasami and Tsunami talked to each other in both the Japanese (Chisa Yokoyama) and English (Sherry Lynn) versions. Sailor Moon had a couple of shared seiyuu (Keiko Han as both Luna and Queen Beryl, Chiyoko Kawashima as Haruna-sensei, Shingo and Sailor Pluto), but usually the characters were too different, not allowing even for a small conversation between them. Then came the fifth season and brought in Chibi-Chibi, voiced by Usagi's seiyuu Kotono Mitsuishi—it's rather easy to pull off this trope when one of the characters has a trait of Pokémon-Speak. Worth noting that the last pair actually ends up playing the role of a Red Herring, especially with all the guesses and jokes about Chibi-Chibi being Usagi's second daughter. Had the anime followed the manga closely, the shared voice would've had a justification, as Chibi-Chibi is Sailor Cosmos, who is hinted to be a form of Usagi from a distant future. In the anime, she is a completely different entity, namely, Galaxia's own Star Seed -- meaning that in this continuity she has nothing to do with Usagi apart from wanting to encourage her to defeat Galaxia. Special mention goes to episode 98, which features Cana and Aquarius bickering with one another—both voiced by Eri Kitamura. Lucy even lampshades how similar the two are (note while Lucy makes such a statement in the manga, it's arguably more effective in the anime to compare just how similar the two sound together). Risky☆Safety: Rie Iwatsubo plays both of the title characters in the original Japanese. In episode 23, she sings both sides of their duet. In the original Japanese version of A Certain Magical Index and A Certain Scientific Railgun, Sasaki Nozomi plays all of the Misaka Sisters except for the much younger Last Order. In the English dub, Brittney Karbowski plays all of the Misaka Sisters including Last Order, and the original Misaka Mikoto as well. ItsJustSomeRandomGuy does all of the male voices in I'm a Marvel And I'm a DC. Mostly, he's very good at making each voice different—with the exception of the strangely gentle Captain America voice, they're all similar, but distinct. However, when characters are worked up they all sound the same. In Resident Evil Extinction, Doctor Isaacs clones Milla Jovovich's character Alice. While these clones do not interact for most of the movie, in the final battle sequence between Alice and Isaacs, Alice watches a clone of herself die in her arms - therefore Jovovich was watching herself die. The movie ends with Alice and a clone standing side-by-side and looking at dozens more clones. The fourth movie, Resident Evil: Afterlife, starts with Alice and her clones bringing down an Umbrella facility, resulting in two or three Alices, all played by Jovovich, featuring in shots at the same time. In "Brothers", there's a scene between Data, Lore and Dr. Soong—all played by Brent Spiner. Another Michael Shanks example—in the episode "Holiday", he plays both Daniel and an alien character, Ma'chello, under heavy makeup. Ma'chello uses a machine to swap bodies with Daniel, leading to an interesting scene where Michael Shanks, as Ma'chello is Daniel's body, argues with Michael Shanks, as Daniel in Ma'chello's body! Subverted in The 7:30 Report, an Australian current affairs programme that has a weekly political satire sketch of a fake current affairs interview, starring Bryan Dawe (usually the interviewer) and John Clarke (the interviewee—a different character each episode but usually portraying an actual person. Often it's a politician). On rare occasions there will be multiple interviewees, with John playing each one. The most confusing aspect of it is that John makes no attempt to imitate who he's impersonating (i.e. they all look and sound like John Clarke in real life, as well as having a habit for dodging Bryan's questions) so at times it looks as though he really is talking to himself. In multiple episodes of Fringe, Anna Torv plays two version of Olivia Dunham—one from "our" universe and one from another universe. While the two characters are usually seen separately, in the season two finale "Over There", our Olivia and alternate Olivia engage in hand-on-hand combat—meaning Torv is fighting herself. Bryn Terfel's "Bad Boys" album [dead link] includes a scene from Don Giovanni that features the titular character, his manservant and his ghostly nemesis. All three parts are within Terfel's vocal range, and he duly performs all of them, singing to himself in triplicate. British kids' show Rainbow features George and Zippy, a classic Odd Couple who are permanently arguing with each other, interrupting and talking over each other—despite being both products of the same actor who is not only Talking To Himself but doing it live. And in the end of that season, Graeme takes over the serial—and is, at that point, playing the main hero (Professor Prune), the main villain (Fetish), and the narrator. Naturally, chaos ensues. Often happened to Bob and Ray, as a consequence of playing both hosts and (often multiple) guests on their various shows, assisted by their uncanny timing and familiarity with each other. The effect is most spectacular when baritone Ray and his falsetto character Mary McGoon hold rapid-fire discussions—often with Ray's other character Webley Webster chiming in—with Bob and two or more of his characters. In one hilarious game of Dungeons & Dragons, one player simultaneously played an elf and a dwarf who were Vitriolic Best Buds on the best of days. He used hand signals to indicate who was who whenever they got in an argument (again). Conker's Bad Fur Day has dozens of characters with major speaking roles, yet only three people do the voices for all of them, and one of those three does only one voice. Chris Seavor actually voiced over forty characters; every single male part except the Great Mighty Poo. Now that's some incredible range. Disgaea: Hour of Darkness has one man playing General Carter, Thursday, and Archangel Vulcanus. While Thursday never has any lines with either of the other characters, both Vulcanus and Carter get a whole scene together. Disgaea 2: Cursed Memories has Rozalin and Taro voiced by the same woman in English. This leads to the disturbing fact that the Cute Shotaro Boy has an unhealthy obsession with himself. In the original audio, Yukari Tamura provides the voice of Rozalin, and Hiro Shimono voices Taro. Disgaea 3: Absence of Justice has Salvatore and the returning Etna both voiced by Michelle Ruff. In The Elder Scrolls IV: Oblivion, one actor performs every character of the same race and gender, sometimes doubling up, and they rarely try to change it up by character. If you hear a female wood elf and a female dunmer talking to one another, they sound like the exact same person, sometimes repeating bits of the same conversation back and forth. The exception is the characters voiced by Patrick Stewart, Terence Stamp and Sean Bean. This is mainly due to the rumour function, which is randomised. If the actors gave each character distinct vocal traits, they'd have to re-record the rumours hundreds of times more. This is exemplified with the beggar in Bruma who actually does sound weak and decrepit, but switches to upbeat and healthy as soon as you ask about the weather. A minor example in Final Fantasy X, notable only for the "oh man, what are the odds" factor: The same actress voices Seymour's mother and his wife in English—and Seymour canonically has one hell of an Oedipus Complex. The Metal Gear Solid series manages to avert this for most part, even though many of the voice actors in both, the Japanese and English versions, voiced various different characters thorough the games. A notable exception in which this trope is played straight is in the Japanese version of Metal Gear Solid 2: Sons of Liberty, in which Akio Ohtsuka played both Solid and Solidus Snake. The 2009 edition of Punch-Out!! features Canadian singer Riley Inge as both Little Mac's trainer, Doc Louis, and the final boss, Mr. Sandman. Both are African-American boxers (one retired, one the champion), and strangely, both refer to Mac as "Mac, baby." Much of the main cast on "The Loud Ponies" share voice actors: we have all 4 male main characters (Lincoln, Clyde, Bobby and Spike) and Applebloom voiced by Jason Griffith, Scootaloo, Lynn, Lana, and Rainbow Dash being voiced by Ashley Johnson, Luan and Lola voiced by Natalie Wilde, and Lori and Twilight being voiced by Kira Buckland. Daniel Riordan was both Optimus Prime (well, his combined form, anyway) and Megatron in Transformers: Robots in Disguise. His lack of variety thing can be seen in The Real Ghostbusters as well—an episode wherein Winston plays a game of baseball that will decide the fate of a single human soul, Maurice provides the voice for the Umpire as well as for Egon. It's vaguely amusing, actually, since the Ump was just Egon with a large reverb! Rob Paulsen played many roles on Animaniacs, The Tick (animation), and bit parts on pretty much every cartoon made in the last decade. In the Batman: The Animated Series episode "Perchance to Dream", Bruce Wayne talked to his father—also Kevin Conroy. Even better: in that same episode, Bruce has an argument with his alter-ego. Conroy is said to have switched between his "Bruce Wayne" and "Batman" voices in real time, rather than recording the characters separately. Hynden Walch played both Starfire and her evil sister Blackfire—and the characters ended up fighting pretty much every time Blackfire showed up. Scott Menville also played Robin and Red X — which made sense since the first time the character showed up he really was Robin, but all of his subsequent appearances were when an unnamed villain stole the old Red X suit. Note, though, that Irwin, a young black boy, is voiced by an adult white woman. ComicCon panel interviews confirm that she was unaware of Irwin's ethnicity when first introduced to the character's design as a colorless sketch. In Star Trek: The Animated Series, the regulars also did many of the one-shot guests (and even secondary and recurring characters). With rare exception, any woman you hear that wasn't a member of Star Trek: The Original Series' main cast will be voiced by Majel Barrett (when they're not voiced by Nichelle Nichols), and any man will be voiced by James Doohan (a.k.a. Scotty). This means there are several conversations in which the two Talk To Themselves—even if Scotty and Nurse Chapel aren't in on the conversation. Cartoon Network's relatively new Marvel project, The Superhero Squad Show, has Tom Kenny as regulars Iron Man, MODOK, and Captain America (comics), all of whom almost always end up interacting in one combination or another. They also have Steve Blum as both Wolverine and Abomination, who again, get a lot of screen time together (and in one episode actually play a round of golf). Due to the limited amount of main characters of KaBlam! 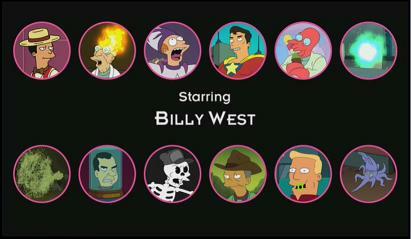 's Henry and June shorts, many of the one-appearance characters will be done by a member of the regular cast (most notably is Billy West, who did most of the recurring characters). One of the most shown examples was in "A Nut in Every Bite! ", in which Dawn, the executive's grand-daughter comes to visit the show. Dawn was done by Julia Mcilvaine, who did June, one of the main characters. A better example would be Scott McCord, who plays both Owen & Trent, who've interacted a few times. And speaking of Huey, Dewey, and Louie appearances, we might as well add in DuckTales (1987) as well. Russi Taylor voiced not only the nephews but also Webby, and the four often worked together being the main kids on the show. The four main Beagle Boys (Big Time, Bouncer, Burger, and Baggy) were voiced by two actors each: Frank Welker as Big Time and Baggy, and Chuck McCann as Bouncer and Burger. Hal Smith also provided the voices of Flinthart Glomgold and Gyro Gearloose, and although not as common as the previous two examples, the two characters did share a couple scenes together; for example one early episode has Glomgold hire Gyro to build giant construction robots for him. This page was last edited on 21 September 2018, at 01:34.